On June 30, 1942, a flight of three P-47 aircraft were engaged in a training flight over Seymour, Connecticut. One of those aircraft (#41-5911) was piloted by 2nd Lt. Henry Andrew Plahetka, 25, of Chicago. According to press reports, pieces of the tail section came down on property on Bungay Road, Great Hill Road, and Curry Road. It was determined that Lt. Plahetka had considered bailing out by the fact that the emergency canopy release was found about a mile from the crash site, and that his seatbelt had been released. It’s possible he chose to stay with the aircraft because he feared for the safety of civilians on the ground. When his plane impacted, he was thrown from the cockpit and killed. 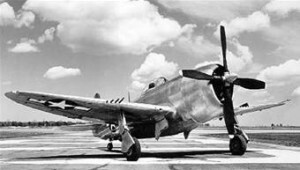 Investigators blamed the cause of the accident on “100 percent material failure on the part of the aircraft structure.” The P-47 Lt. Plahetka was piloting was a “B” variant, and had been delivered to the Air Corps on June 6, 1942 – just 24 days before the accident. Lt. Plahetka enlisted in the Air Corps in Chicago on November 3, 1941, and obtained his pilot’s wings on May 20, 1942. At the time of his accident he was assigned to the 61st Fighter Squadron based in Bridgeport, Connecticut. Unknown newspaper article accompanying army investigation report, “Lt. Plahetka crashes To Death In Birmingham Water Co. Woods After Plane’s Tail Assembly Falls Apart”, unknown date.